Up to now I've never owned a wooden spokeshave. The reasons were mostly that when I was studying we didn't use them, and most of the woodwork I did didn't call for shaves. However, as I have gotten older, I have gotten more interested in complex furniture shapes and I found that I needed something aside from a rasp to sculpt my work. My first shaves were metal, but I never got them to work as well as I thought they should. Then I discovered wooden spokeshaves and I was converted. What I like most about wooden shaves is that they are light and nimble. They have the same feel as for example, our bowsaw where the tool is so light it doesn't influence the cut and you really feel that you are moving a blade over the work, not running a machine over some wood. The second feature I really like is that I normally set a shave for a fairly fine shaving but if I want a thicker cut all I have to do is loosen the screws at the top by a quarter turn and the shavings just push the blade out and you get a thicker shaving. I don't have to stop and think and that's important. Finally with a wooden shave the blade angle is really really low and cutting end-grain is a snap. 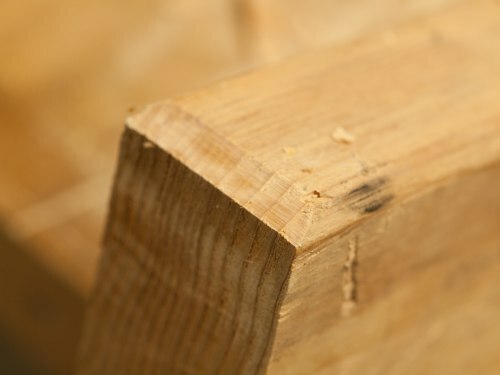 In the second picture you can see a chamfer I cut on a piece of construction grade pine, with the shave in the first picture, using the blade as it came from the factory. Nearly an ideal cut, (it took about three or for shavings), and the blade isn't even as sharp as I would get if I actually sharpened it. 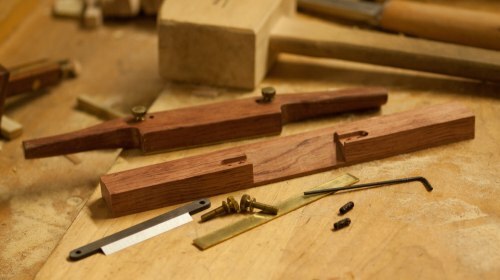 While I could have bought an old shave I build the shave in the picture from Ron Hock's most excellent spokeshave kit. I kind of like the idea of building my own stuff, it's practical - and this kit is even easier to make than our bowsaw kit. Most important it was a fair amount of fun. You glue on the brass, cut away the waste, and shape your handles to your heart's desire. The actual cutting geometry is already done for you. It took me maybe an hour start to finish. And it works great. I might want to add some relief to the brass to give easier action, but I am waiting until I sharpen it first. When Ron Hock comes Brooklyn next week I plan to show it off to him, and if you come to his event at Makeville Studios on October 25th you can inspect mine, and if you want you can sign up for a kit building session yourself with the master to guide you through it. You don't really need that much guiding but we will bring the epoxy, a bunch of rasps, and any other tools to make everything move fast and easy. If you don't want to make the shave, we are also holding a plane clinic and Ron is giving a talk at seven. So it's not an event to miss. Details here! Good timing as I was just looking for a spokeshave! I notice the older I get the more I can't stand the droning noise or dust from power tools and seem to be slowly adding more hand tools to my shop to take their place. Nice looking shave. I built one from the Lee Valley kit and it is far superior to the metal shaves I have. I've been looking for a spokeshave to replace a small stanley shave that was passed to me by my grandfather before it's totally worn out. I use it every day to the soft shoulders on my paddles. This might be the solution for me. I need a shave that will allow me to make an inside curve.